Nara is a fantastic place to enjoy Japan’s famous cherry blossoms. The parks, gardens, temples and shrines of the city are studded with cherry trees. Here is information on timing and a list of the best spots. In a hurry? Scroll down to our list of Nara’s best cherry blossom spots. For information on the timing of cherry blossom season in Nara, read the following section first. When is cherry blossom season in Nara? In Nara, the cherry blossoms (sakura) usually bloom in the last week of March and the first two weeks of April (roughly between 20 March and 14 April). In an average year, the blooms peak on 1 April in Nara. Once they bloom, they are notoriously fickle: sometimes almost all the trees will come into full bloom (mankai) at the same time and stay in full bloom for a week or even longer. Here is our list of the best cherry blossom spots in Nara. For more details on these places, visit our Things To Do in Nara page. 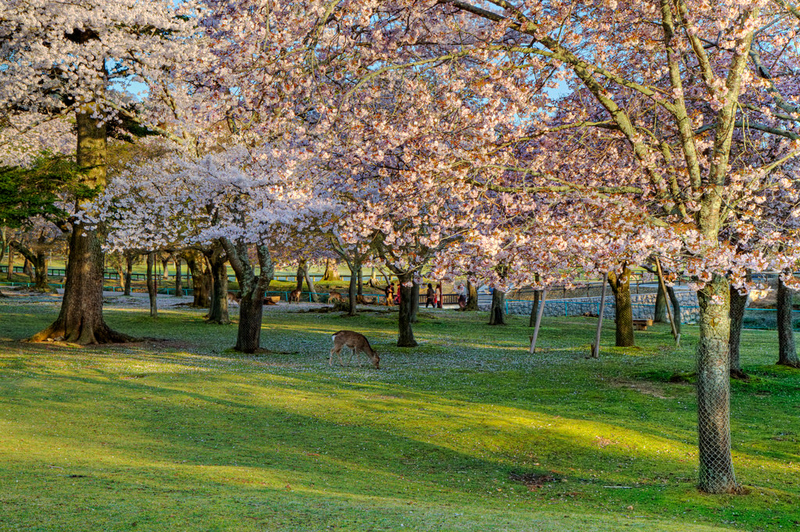 Nara-koen Park: There are plenty of cherry trees in this expansive park and it’s a great place to enjoy the blossoms (and the company of the deer). Nara Himuro-jinja Shrine: This shrine, just southwest of Todai-ji Temple and across the street from Nara National Museum, has some lovely trees and it’s right on the way to Nara-koen Park. Wakakusa-yama: This hillside, which towers above the city and is along the way from Nigatsu-do to Kasuga-taisha, has some great cherry trees running up the side of it. Koriyama-jo Castle Ruins: These castle ruins, a little west of Nara City, are studded with some beautiful cherry trees. Further afield – Yoshino: If you’ve got half a day to spare and you don’t mind serious crowds, then head south of Nara City to check out the cherry blossoms that cover the hills in and around the town of Yoshino. 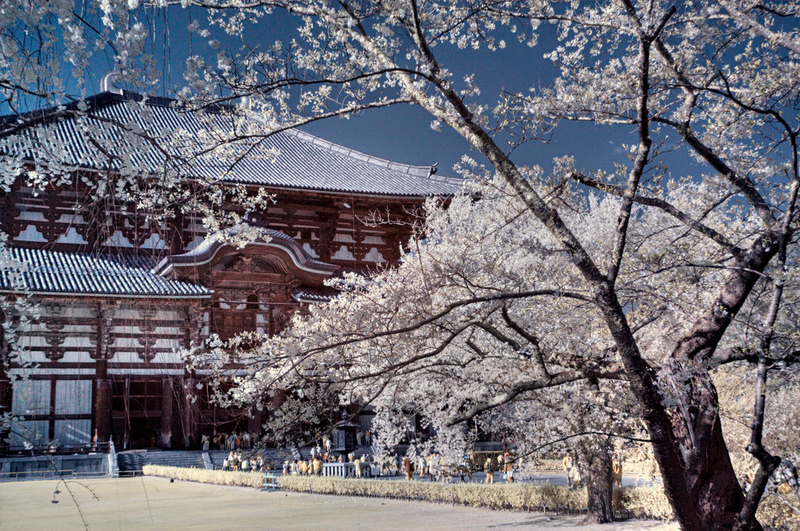 This is one of Japan’s most famous cherry blossom spots. Where Are These Places Located? You will see the list of places on the left hand side. (Click the 3-line icon in the top left corner if not). Scroll down or use the map search (the magnifying glass icon) to find the place you want. Click the name of the place in the list. Its location pin will be highlighted on the map. If you're using the map on your phone, open the map and then search for the name of the place. The map will then zoom in on its location. We also have guides about things to do in Kyoto, Tokyo, Kanazawa, Takayama, Hiroshima and Mijiyama. Chris Rowthorn's private tours of Kyoto, Tokyo, Nara and Japan. Personal and attentive trip planning and consulting. First Time In Kyoto? Start Here! How Much Money Do I Need For Kyoto? Things To Do In Kyoto Overview – Start Here! Japan Rail Pass – Is It Worth It? Do I Need A Visa For Japan? designed to provide a means for sites to earn advertising fees by advertising and linking to amazon.com and amazon.co.uk. © 2019 InsideKyoto.com. All Rights Reserved.